Everyone who is in the Bansko region has to visit this incredible and amazing natural landmark. It is a great idea to spend one day visiting this unique natural phenomenon. It is best to see the Seven Rila Lakes during the summer months as they are the most attractive in this season, also they are an excellent option for one-day trip to escape from the daily routine of the city and a great chance to enjoy the magnificent nature. The Seven Rila Lakes are one of the most remarkable natural sites in the Balkan Peninsula. Visiting this place is an unforgettable experience. The amazing and enchanting beauty of the Rila Lakes attracts not only the Bulgarian tourists but also visitors from all over the world. The Seven Rila Lakes is a group of lakes with glacial origin located in the Rila Mountain. This lake group in Bulgaria is the most visited by Bulgarian and foreign tourists and it is part of the hundred national tourist sites to see. 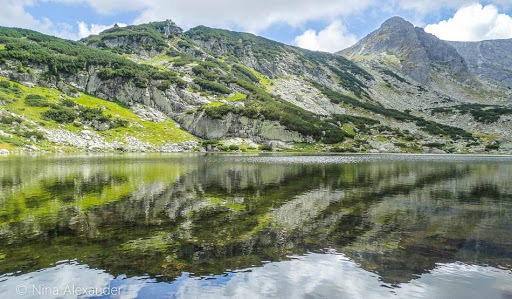 The lakes are located in the picturesque cirques in the Damgski area in Northwest Rila Mountain, as they are situated amphitheatrically between 2095 and 2535 meters above sea level. The cirque in which they are located is surrounded by the peaks of Suhi Chal, Harmiyata, Otovishki peak. They occupy furrows along the slope of the mountain and the individual lakes are interconnected with each other through small streams. In the process of water flow, small cascades and waterfalls have formed along these streams. The first three lakes (The Tear, The Eye and The Kidney) drain separately in the Twin, then the water passes subsequently through the Trefoil, The Fish Lake and the Lower Lake. A more powerful stream passes through the last two lakes, which when running from the lowest lake, gives the beginning of Dzherman River (which s the left tributary of Struma River). The name of each one of the Seven Rila Lakes represents its specific features. The lake, which is situated at the highest altitude is called the Tear, because its water is crystal clear and transparent. Second by height is the the Eye Lake (also called the Heart), which has almost oval shape. 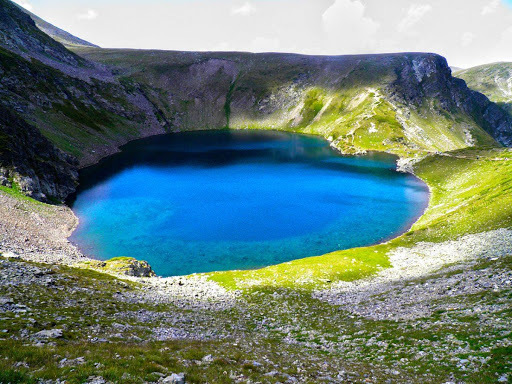 The Eye is a cirques lake with largest depth in Bulgaria – its depth is 37.5 meters. The Kidney is the lake with the most steep shores of the whole group. The fourth lake is the Twin. It is the largest of the whole lake group. The Trefoil Lake has an irregular shape and low shores. The most shallow of all lakes is the Fish Lake, as on its northeastern side is located the „Seven Lakes“hut. The lowest located lake is the Lower Lake, from where the Dzherman River starts to flow. 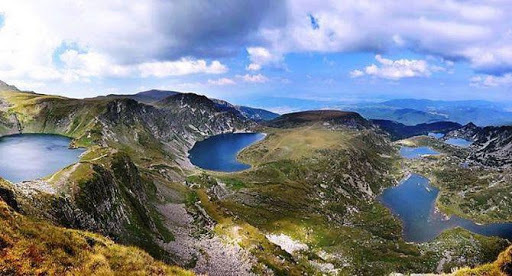 According to the legend of the Seven Rila Lakes, thousands of years ago when Earth hasn’t yet been populated by people, the Rila Mountain was the home of two giants – a man and a woman. Their love was so strong and they worshiped the beauty and coziness of their lovely home. Their home was incredibly beautiful, always warm, sunny and pleasant. Every single creature was falling in love with this place and wanted to live there. All the elements around the world supported the giants and their love. One day, however, troubles came, evil forces passed by their home. When they saw this beautiful place, the evil forces felt envy because of the happiness of the giants, so they became angry and decided to destroy their home and their love forever. They began to send black clouds and destroying winds towards them. The earth was shaken by terrible earthquakes. The male giant defended with all his strength every blade of grass, every little stream or flower, as he guarded his beloved and fought against the attacks of the evil forces. Unfortunately, this only made them angrier and they decided to fulfil their evil plan to the fullest. In one heavy battle the giant found his death. Satisfied with their victory the evil forces decided to go and left behind them only destroyed rocks, meadows and the sorrowful female giant who was devastated. The sadness of the young widow was so strong that her tears were endless as they flew down along the mountain ridges to the valleys. As the tears were falling down they gathered in the glens, thus they formed crystal clear lakes with enchanting beauty – the Seven Rila Lakes. Before you reach the Kidney Lake, your tourist guide will show you a huge rock located in the direction of the Tear Lake. The shape of the rock looks very much like the figures of a man and a woman of enormous size. According to the legend, these are the two giants in love, who will remain forever there protecting their magnificent home. The trip from Sofia city to the Seven Rila Lakes lasts about an hour an a half. 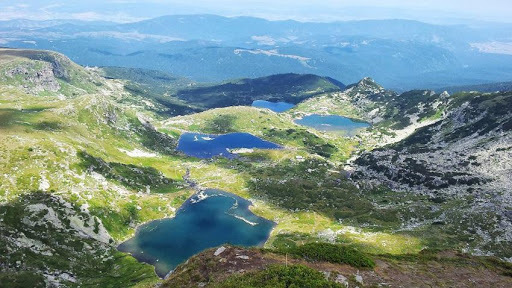 Less than 90 kilometers are from Sofia city to the lower station of the two-seat ropeway „Rila Lakes”. The Tear, the Eye, the Kidney, the Twin, the Trefoil, the Fish Lake and the Lower Lake can be reached after a walk that lasts up to 4-5 hours, starting from the “Rila Lakes” hut and 4 kilometers from Panichishte. From there, there is a rehabilitated asphalt road, which is maintained in good condition. The distance between Separeva Banya to the Rila Lakes is 13.5 kilometers. When we enter Separeva Banya we can orient ourselves with the help of the signs indicating the way to the resort village of Panichishte. Upon entering Separeva Banya we can see signs that indicate the route to the resort village of Panichishte, and on the way out of the town, along the way there are signs indicating the route to the lift. There is a paid parking zone in the area of the lower lift station. Using the lift you will get to the hut in less than 20 minutes, overcoming a distance of more than two kilometers and a displacement of six hundred meters. During the most part of your trip with the lift you will pass by centuries-old forests of pines and firs, and in its upper part you can enjoy the beautiful sights of the Rila National Park, especially to the Malyovitsa area of the mountain to the east. The upper station of the lift is located a hundred meters away from the “Rila Lakes” hut. The nearest lakes are in a 40-minute walk from the “Rila Lakes” hut. You can get to the Kidney Lake by following the upper path along the route of the trail on the Suhia rid. You can reach the Fish Lake following the old path to the southeast. During the walk you can start the trip following one path and return following the other. From Separeva Banya, follow an asphalt road to the „Pionerska“hut. From „Pionerska“ hut you should get on the lift to the Rila Lakes, which goes to the „Rila Lakes“hut. From Govedartsi you can reach the lakes by following an asphalt road leading to Vada hut and from there to „Rila Lakes“hut. From Govedartsi follow an asphalt road to the Malyovitsa resort complex, then from Malyovitsa hut to the „Rila Lakes“hut.